Moss Removal From A Roof - Why Clean Moss From A Roof? There are many reasons for moss removal from a roof. The following are a few of the most common reasons for moss removal that we come across and the methods we would use to clean the moss from a roof. 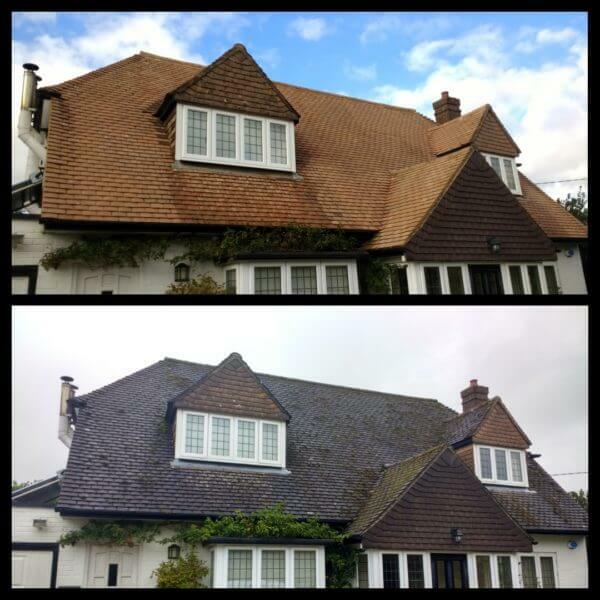 Apperance: One of the most popular reasons to clean your roof is improving it’s aesthetic. 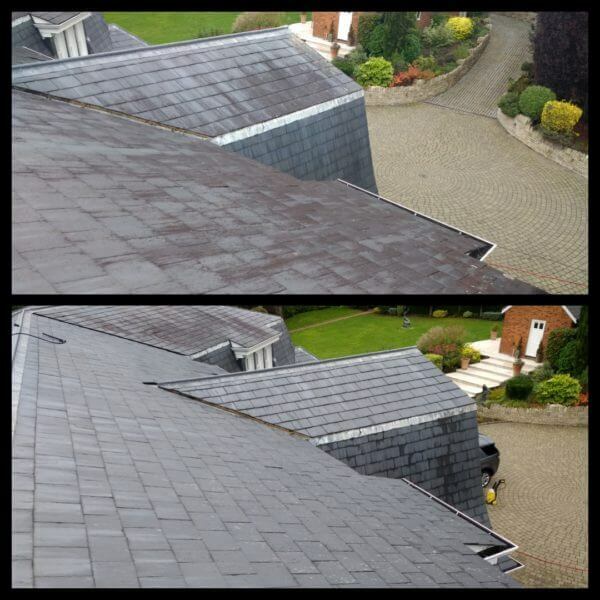 A clean looking roof can dramatically improve the first impressions of your house. If you’ve spent a lot of time and effort making the rest of house and garden look impressive then the removal of moss from a roof will make all of that work worthwhile. The curb appeal of a clean roof can also help sell or rent your home. 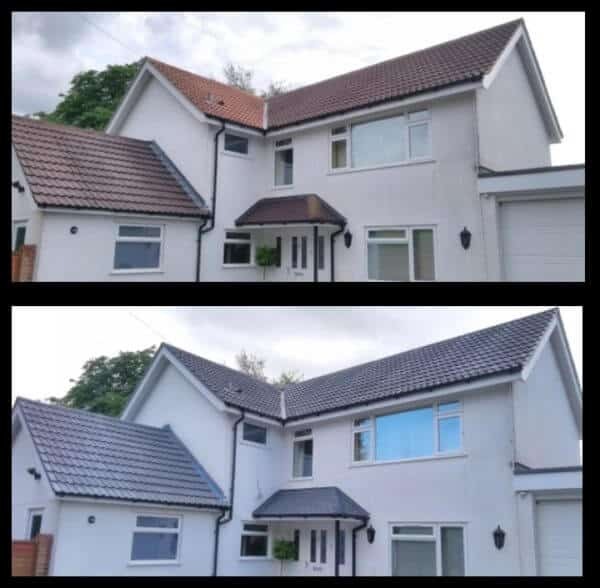 If you want to take this a step further and also change the colour of roof then take a look at our roof painting options. Moss falling: We hear over and over again how frustrating it is to have to constantly sweep your patio or driveway free from moss. When there is so much moss of the roof that it is falling daily it is a big indicator that it’s time for moss removal from the roof. At this stage it is likely that your gutters are full, causing drainage problems and possible future damp problems. Damage to tiles: Where there is large amounts of lichen (white spots) on your roof it can, over time, cause damage to the tiles creating holes and cracks (especially common in thin concrete tiles) White lichen is especially hard to remove and can often take a few months to fully fall away from a roof after chemical treatment. In some cases we may recommend pressure washing these areas. Homebuyers survery: It is becoming more frequently recommended in home buyers surveys that the roof be cleaned. 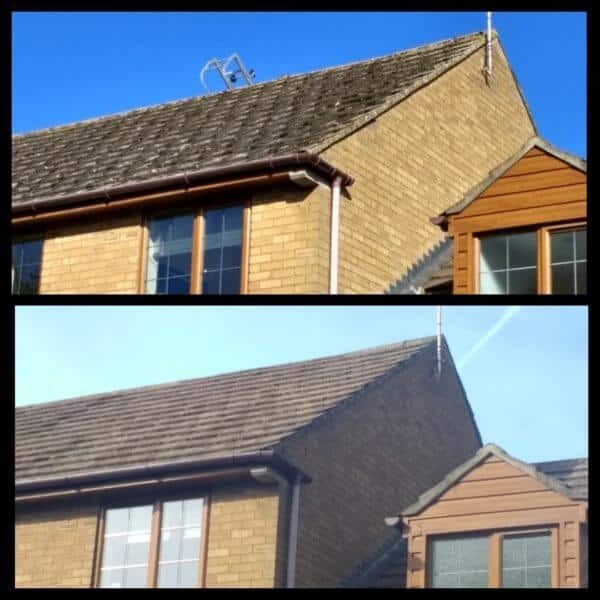 The surveyors are aware that large deposits of moss on a roof will restrict the free flow of rain water to the gutters and can possible cause damp damage. Roof repairs: Occasionally a roofer will request moss removal from a roof before a survey for any future work to take place. 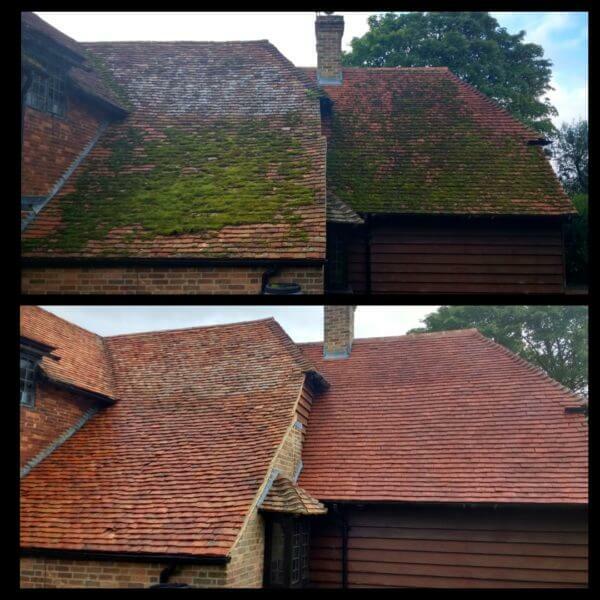 Large amounts of moss can hide many problems on a roof and it’s best to remove it first. 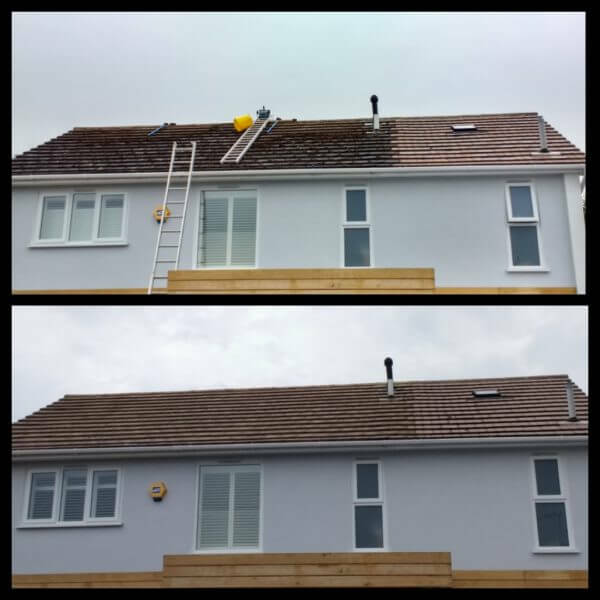 If you have taken all of these possible reasons to clean your roof into account and decided to go ahead with roof cleaning, you then have the difficult task of choosing the best roof cleaner in your area. We advise that you look for a cleaner that has good reviews and is happy to discuss cleaning methods with you. 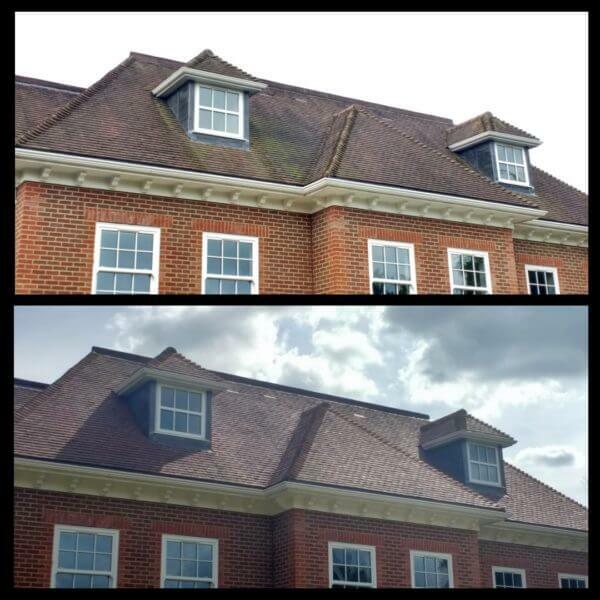 We use softwashing methods (chemical cleaning) and pressure washing methods to clean a roof. 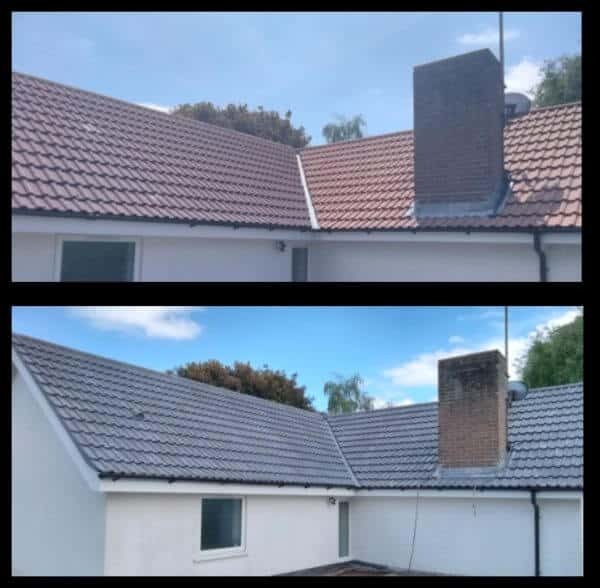 Each one has their pros and cons and we will discuss these options with you.Any reputable roof cleaning company should be happy to discuss the options with you and advise on the best method. A roof cleaning company should work safely on your roof, provide basic roof repairs if necessary and be honest about and willing to explain the cleaning methods used. 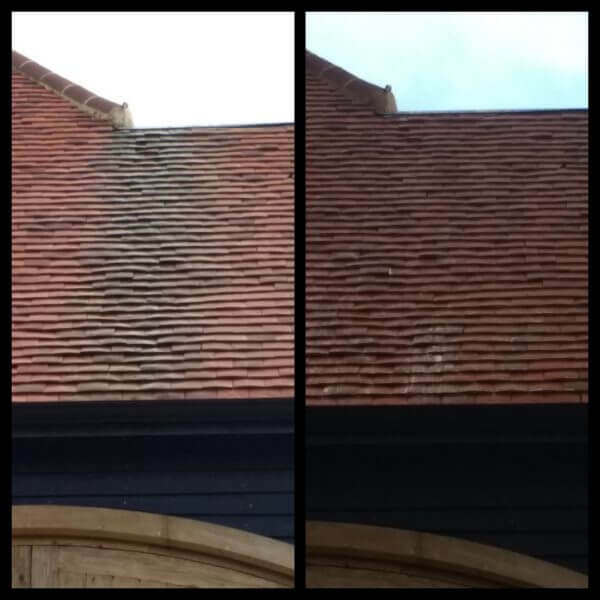 If you are looking for a roof cleaning company in the south of England then please use our contact form to get a obligation free quote.